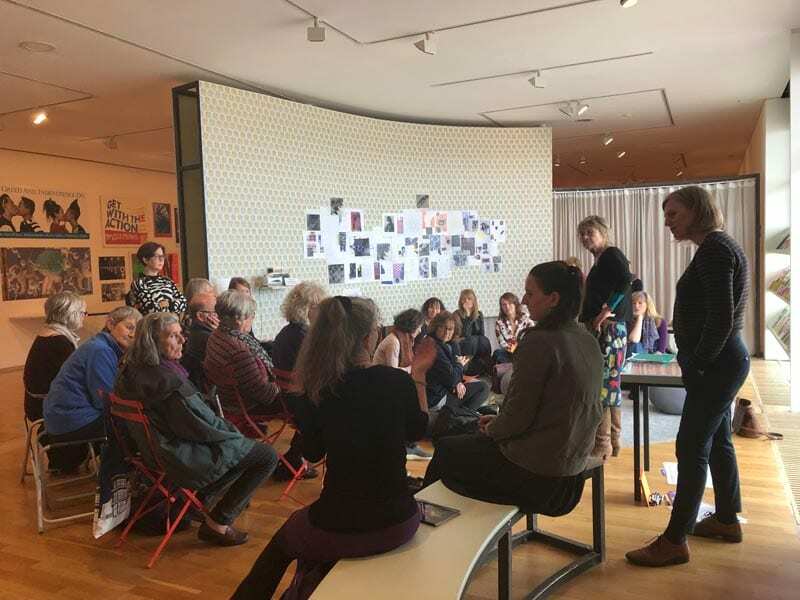 Our aim for the workshops was to both provide information about the local women’s suffrage campaign and some key women within that campaign, and to make space and time for people to express their personal views verbally and creatively, using written and visual outlets. With this in mind, Ashley McCormick and myself met on a couple of occasions to identify appropriate crossover elements within the Still I Rise exhibition that could be used to introduce elements from the local women’s suffrage campaign, based on my book Turbulent Spinsters: Women’s Fight for the Vote in Hastings and St Leonards. Reasons for doing this reflect the fact that local suffrage activity is not well known and also that, it can be argued, women’s fight for the vote was an extremely important example of women’s resistance that issues around feminism and gender highlighted in the exhibition. Once we had identified the appropriate exhibits, we were able to plan and organise the workshop, ensuring a balance between providing information and encouraging participation in the form of various activities. We began at the entrance to the exhibition with a general welcome and introduction, and a brief overview of the local women’s suffrage campaign, introducing local campaigner Barbara Bodichon and defining ‘suffragist’ and ‘suffragette’ along the way. Attendees were then invited to define what feminism(s) meant to them and to record personal acts of resistance. Some were shared and generated a lot of discussion. We then moved to the first exhibit, a board game Roots and Bootstraps, which we examined. I used the exhibit as a jumping off point to explore issues of class within the suffrage campaign. I described the class composition of the local campaign, introducing activists such as Emma Fricker Hall, Jane Strickland and Lady Muriel Brassey. Participants were invited to make a list or diagram of female friendships and alliances and their meaning to them. The exhibit Water Cooler Moments provided the opportunity for me to discuss verbal and physical attacks on suffragettes, locally and nationally, including hurling missiles, anti-suffrage letters to the press, physical attacks by the police and force-feeding. This was followed with an activity based on producing a mind-map of barriers that women still face today. Our third stop was at Mary Lowndes’ suffragette banners and See Red posters, which I used to talk about the creativity and pageantry of women’s politics via banners, posters and slogans. 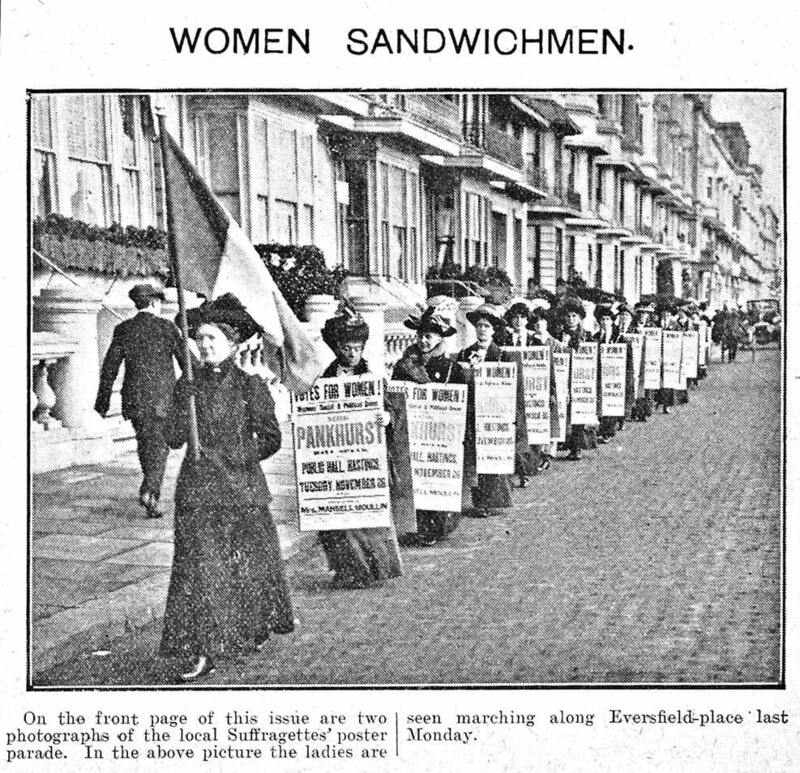 I also gave examples of local suffragists and suffragettes, such as Isabella Darent Harrison who joined major demonstrations in London and also carried out creative acts of resistance in Hastings and St Leonards. Finally we moved to the roof top foyer where we invited people to create campaigning slogans and placards, using coloured paper, stencils and collaging material. A number of brilliant slogans were produced and there was energetic discussion around a number of issues. I enjoyed co-facilitating the workshop enormously. It was a lively and enthusiastic event. Participants were clearly engaged and found the subject matter stimulating, generating some very interesting debates. These in turn raised important issues such as the difficulty in defining feminism, the interlocking natures of oppressions, how personal acts of resistance, such as deciding not to wear make-up, might seem quite small, but can have a much wider impact. All the participants who attended certainly seem to have appreciated the workshop and to have gained insight and inspiration from the experience, not least the opportunity to discuss gender issues with others. I was delighted to have the opportunity to co-facilitate the workshop and found it a very positive experience.